The Healthy Boy: Are You Addicted To Sugar? If you are still asking yourself whether sugar is bad for you, then let me answer that for you; YES IT IS! The question you should be asking yourself is "Am I addicted to it?" Turn over any product in the grocery store these days, from bread to milk, to pasta and even frozen fruit and vegetables, they all contain added sugar. 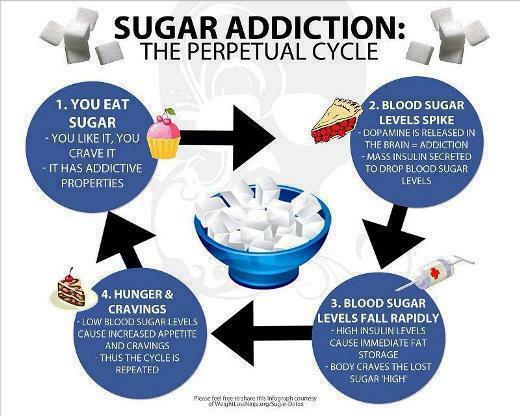 The above graph does a great job of showing us the perpetual cycle of sugar consumption and its affect on creating an addiction within our bodies. For the people out there with high metabolisms and aren't scared by diabetes or the other negative affects of sugar on your internal organs, check out my previous article; Does Sugar Give Your Wrinkles.